Saudi Arabia has decided to break off diplomatic ties with Iran, amid a row over the execution of Shia Muslim cleric Sheikh Nimr al-Nimr in the Sunni Muslim kingdom, Saudi foreign minister Adel al-Jubeir has announced. Adel al-Jubeir was speaking after demonstrators had stormed the Saudi embassy in Tehran. Sheikh Nimr al-Nimr and 46 others were executed on January 2 after being convicted of terror-related offences. Adel al-Jubeir said that all Iranian diplomats must leave Saudi Arabia within 48 hours. Saudi Arabia was recalling its diplomats from Tehran, he said. Adel al-Jubeir said Saudi Arabia would not let Iran undermine its security, accusing it of having “distributed weapons and planted terrorist cells in the region”. “Iran’s history is full of negative interference and hostility in Arab issues, and it is always accompanied by destruction,” he told a news conference. “We believe that diplomatic engagement and direct conversations remain essential,” he said. Earlier on January 3, Iran’s Supreme Leader Ayatollah Ali Khamenei warned that Saudi Arabia would face “divine revenge” for the execution – an act which also angered Shia Muslims elsewhere in the Middle East. Ayatollah Ali Khamenei called Sheikh Nimr al-Nimr a “martyr” who had acted peacefully. Protesters stormed the Saudi embassy in Tehran on January 2, setting fire to the building before being driven back by police. The Saudi foreign ministry said none of its diplomats had been harmed in the incident. Iran is Saudi Arabia’s main regional rival – they back opposing sides in the conflicts in Syria and Yemen. Relations between the countries have been strained over various issues in recent decades, including Iran’s nuclear program and deaths of Iranians at the Hajj pilgrimage in 1987 and again in 2015. Most of the 47 people executed by Saudi Arabia were Sunnis convicted of involvement in al-Qaeda-linked terror attacks over the last decade. Sheikh Nimr al-Nimr was involved in anti-government protests that erupted in Saudi Arabia in the wake of the Arab Spring, up to his arrest in 2012. 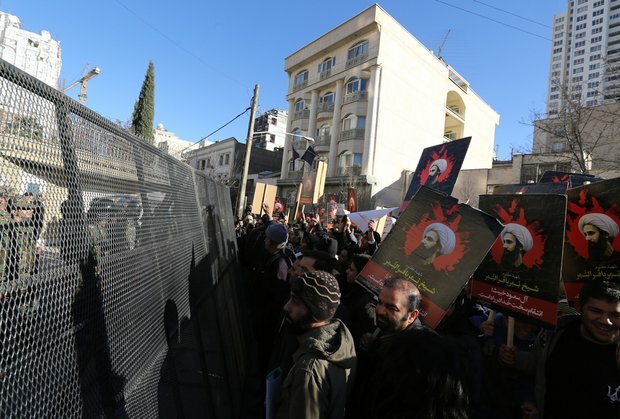 The execution sparked new demonstrations in Saudi Arabia’s Eastern Province, where Shia Muslims complain of marginalization, as well as in Iraq, Bahrain and several other countries. The top Shia cleric in Iraq, Ayatollah Ali al-Sistani denounced the execution as an “unjust aggression”. The leader of Lebanon’s Shia Hezbollah movement, Hassan Nasrallah, launched his sharpest attack yet on the Saudi ruling family on January 3, accusing them of seeking to ignite a Shia-Sunni civil war across the world. Hassan Nasrallah said the blood of Sheikh Nimr al-Nimr would “plague the Al Saud [family] until the Day of Resurrection”, prompting cries of “Death to the Al Saud!” among an audience watching his address.